Early voting is happening now and we want to provide you with the locations and times so that you can spread the word! 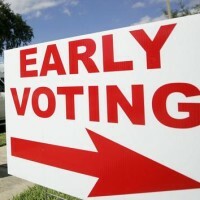 Volunteer to stand early voting locations with us and help take back SD10 for conservatives. Times are: Tuesday 18th – Friday 21st 8am to 5pm, Saturday 22nd 7am to 7pm, Sunday 23rd 11am to 4pm, Monday 24th – Friday 28th 7am to 7pm.